The Christmas Baking is underway. I have used this cut out recipe for 37 years now. We received it along with others for a wedding gifts and it’s the gift that keeps on giving. This is a triple batch. They are so good you could eat them without frosting and they do not need cooled before I roll them out. This is the best tasting homemade buttercream frosting I have come across. It is not too sweet, it is smooth and I love the different flavorings that it calls for. RECIPE: 1/2 cup Vegetable shortening… 4 cups powdered sugar… 5 Tablespoons water…. 1/2 t. salt…. 1 t. vanilla…. 1/2 t. almond flavoring…. 1/4 t. butter flavoring. Mix it together until smooth and creamy. I was trying out some torn paper flowers that I am going to use in a painting soon. They turned out fine and are fun to make too. The next few pictures are the cat shenanigans that have happened this week. If you saw these on facebook, please bare with me. She was stealth. Plugged in the iron, turned my back and turned back around, there she was. Look at me, look at me. Just keeping everyone company up there. I pulled this from the archives. It’s amazing to me that this little kitten in June. Has turned into this big guy a few short months later. I love this picture! We have this tree in a box window that looks out over the front of the house. It’s a favorite of the cats. This little guy is the cat above and below. They stay kittens such a short period of time. He needs to be careful, he is growing so fast he might not be able to get out! 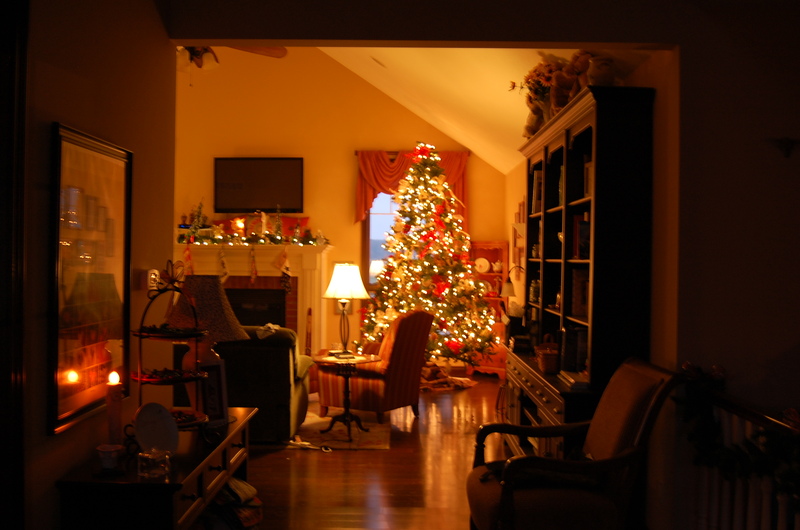 Love to see this big tree it makes the room so warm. I have a time getting the angel on top though. I have to remember to attach her to the top first before we add the last set of branches. Yesterday watched the classics, Rudolph, Frosty and then Elf. That one always makes me laugh. I am going to put in : It’s a Wonderful Life today. Gotta get those cookies frosted! Hope your preparations are coming along well. This past Saturday, Dec. 2nd I did just a small show-12 vendors. We were in a nice clean big equipment barn. I was fortunate to have my niece Wendy help this time. Here is a cute selfie of the two of us. My table all set up and ready to go. I was glad that the weather had not turned really cold yet because it would have been uncomfortable for sure. They suggested that we bring electric blankets because the barn is not heated. That is a good idea! We put the Christmas tree up, its 11 or 12 feet and is pre lit, sorta. Of course they all don’t work so I just put lights in the three bare spots. It’s a great concept, does anyone’s prelit tree ever stay completely lit?? I am really happy with the prettiness of it. There is a little brown box on the right under the tree. It has the ashes of our cat Smoke who lived to be 19 yrs old. He loved the Christmas Tree and couldn’t wait to sleep under it. Every year we put his ashes where he always slept. The quilt is very old and very tattered and very loved and I love it for the tree skirt. The rest of the year it sits on a shelf. I absolutely love these faux candles! They are the cat’s behind! This remote turns them all on, they will shut off in two, four or six hours. The lights can be turned down. Love it!! Last year I did a three day show at the beginning of December and I was behind the rest of the month. I will only do a small show from now on, I am enjoying December now. We really have kept the decorations in the main living area only. After 37 years we have accumulated a lot of decoration goodies. I pick and choose about what goes out because I don’t want to have to take them down, it is a chore. I have enough to give the boys and wouldn’t notice. Simple yet elegant. We also have a few lights outside and I have these 3 simple stair stepped size trees. Our wind has been strong these last few days and I cannot keep them up, two are usually on the floor of the porch. How people put lights all over their house is mind boggling to me, they just have the temperament. I am always in awe. Temps are only in the 20’s with a little tiny bit of snow. It is now feeling like winter. I have been enjoying the slow process of decorating for Christmas this year. I try not to put so much out that it is an overwhelming burden to put it back away. I have amassed quite a bit of decorations in 35 years of marriage. I am being choosy about what I put out and it changes every year, which I love….variety. I have angels on the fireplace this year. I realized that I have quite a few different ones and they are the showcase this year. I will show them off on another day with stories. 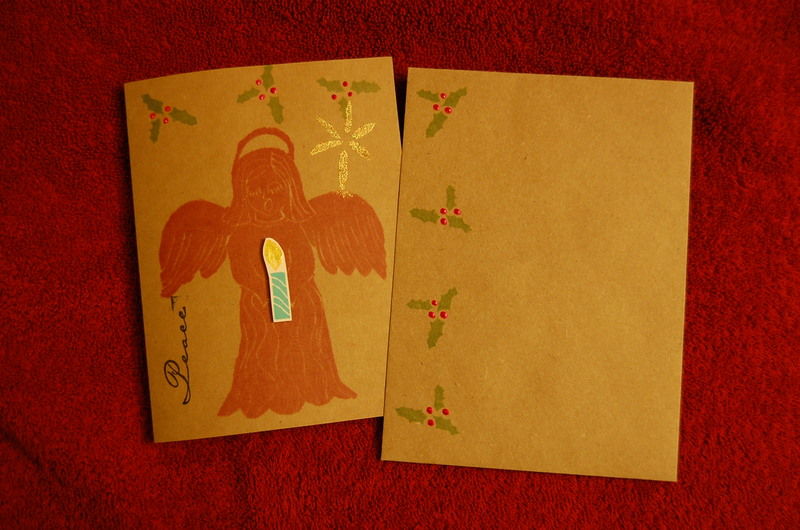 My handmade cards, here and there are some spots that maybe didn’t stamp exactly right. Or the flame is a little crooked but I am giving up on perfectionism. It’s made by a human and that’s far from perfect. It shows that I took the time to make these and they have a good meaning behind them. I love to receive handmade. A lot of love goes into it. I have also rediscovered a few decorations I had forgotten about. 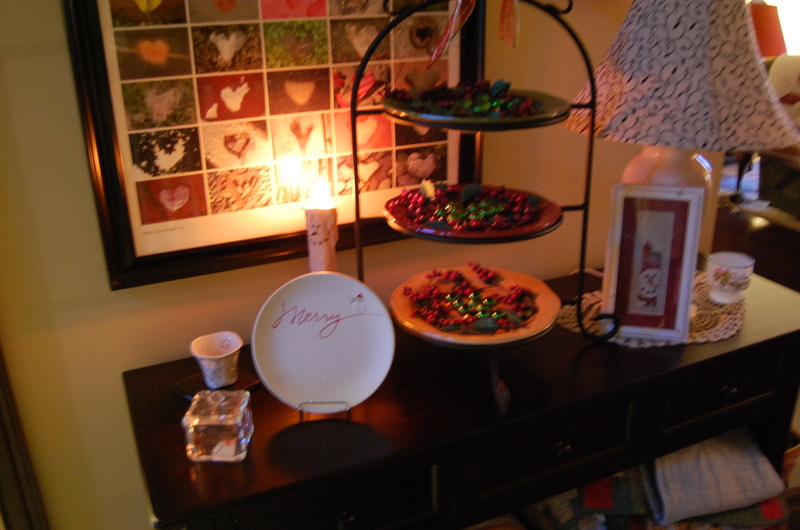 My niece Wendy had gifted the little Merry plate a few years ago. What a dee-light to find it again. (I have been watching the Roosevelt’s and FDR said that often, I thought it was charming). I also uncovered the little crosstitched snowman picture, the box that is an ice cube snowman and a handpainted candle holder….all fun. I hope that you have been having a Dee-Lightful time decorating and it hasn’t been a burden. Take a deep breath and enjoy. Till next time…thanks for stopping!